Gulf Craft has confirmed that the third hull in its 31.68 metre Majesty 100 motor yacht series has been named Oneworld and delivered to Australia. The follow-up to the 2017 launch Nahar, Oneworld arrived in Sydney earlier this month. 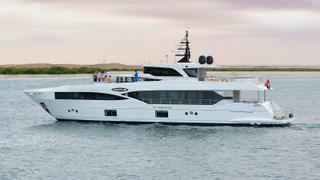 She will be based on the East Coast and offered as a yacht for charter through Ocean Alliance. Built to comply with LY3, RINA and DCV standards, this all-GRP yacht is the first in the Gulf Craft collection to feature a convertible skylounge, allowing owners to quickly seal off the upper deck when required. The in-house design team placed a strong emphasis on extending the outdoor experience to the interior space, which can be seen in the 1.8 metre tall windows in the main saloon. Accommodation is for up to 12 guests in five cabins, while the crew quarters is suitable for a staff of up to six people. 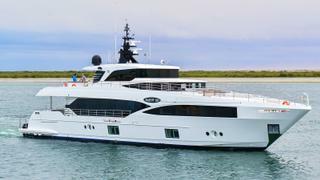 Power comes from a pair of 1,900hp MAN diesel engines for a top speed of 20 knots. When trimmed back to her economical speed of 12 knots, Oneworld will boast a maximum cruising range of 1,500 nautical miles drawing on a total fuel capacity in excess of 15,000 litres. Other superyacht projects currently under development at Gulf Craft include the flagship Majesty 175 yacht, which is due to launch in late 2019.